MINIsOnTop 2003 – the ultimate MINI event! Posted on June 22, 2003 February 25, 2017 by Ian C.
My! What a weekend MINIsOnTop [MOT2003] was! The awful downside is the audio destruction done to my MINI by Tweeter – I don’t yet know if there is something they did wrong that can be improved, or if the Harmon Kardon factory stereo is just perfect for the MINI. But currently GBMINI has much less bass than before, and it is often hard to distinguish the vocals. The whole stereo thing is just a stomach-churning nightmare at the moment! On the great excellent amazing stunning side, it was MINIs On Top this weekend! Friday afternoon Margaret & I packed and drove north into New Hampshire to North Woodstock, where we stayed at the Three Rivers House; a characterful place but pricey and annoying downsides like half hour wait for hot water in the tub, and ultra-slow draining sink! 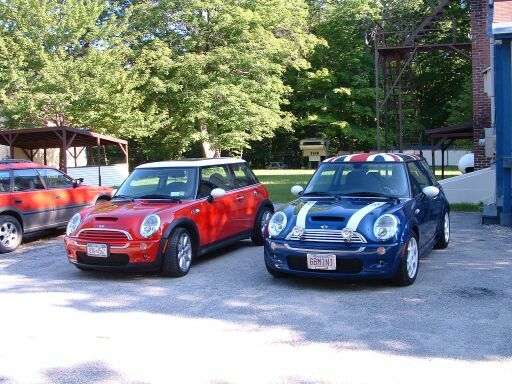 Late Friday night we heard what sounded like another MINI pulling in – too dark to see, but in the morning my hearing was confirmed (the red MINI is owned by Keith Winslow). After breakfast we headed to Loon Mountain; we were supposed to meet from about 11am but we got there around 10 and there were many others ahead of us; more and more MINIs arrived, to a total of over 70! Steve Barnatt, who did an incredible job organizing the event over the last few months, handed out the T-shirts and numbered every MINI. We set off along the Kancamagus Highway shortly after midday. The original plan was to stop at a scenic overlook and have lunch, but I guess we were having too much fun driving! I pulled over at one parking area to take pictures of the cars passing – sorry to have confused a number of MINIs into pulling over with me! Eventually we all turned off onto Bear Notch Road and stopped at the first overlook. There was just about enough room for everyone to fit! After lunch we continued on Bear Notch Road, then dispersed for the afternoon. We checked in to the Royalty Inn (where 10-15 other MINIs were also checked in) and explored the trinket and craft stores in Gorham. Everyone headed to the Mount Washington Auto Road start, for more conversation and some great BBQ. 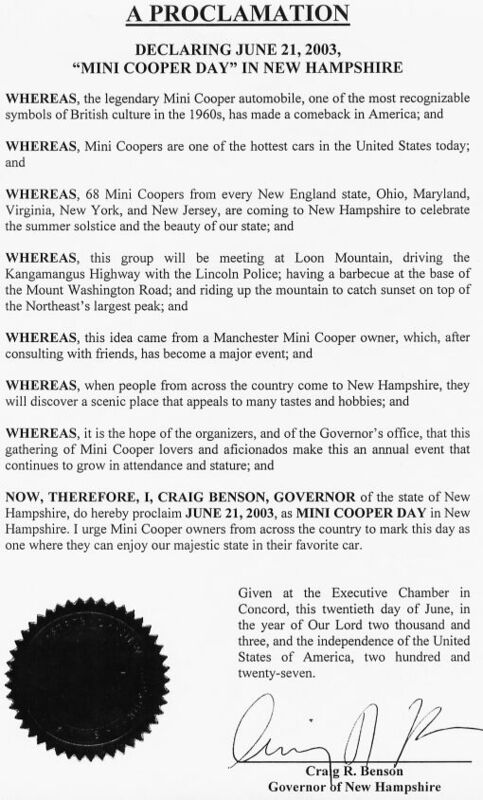 Various prizes were handed out (cleanest & dirtiest MINI, longest journey – over 700 miles from Cleveland, etc) then John Secco read out an official proclamation from the New Hampshire Governor declaring June 21, 2003 “MINI Cooper Day”! Finally the auto road drive began. Everyone lined up at the base; we were led up the road by an official vehicle, which made sure that no-one took any corner too fast and slid off the mountain! First and second gear was the order of the day, and everyone made it to the top – although there were a few hot engines. We all gathered on the viewing area at the very top of Mount Washington, and watched the sunset – a little cool and windy – but after such amazing weather all day no-one was complaining! You can find many more pictures on the MINI2 thread. Thanks to everyone for an amazing weekend … I miss you all! ← GBMINI stereo – Tweeter install looks nice but sounds dreadful!